So there’s this guy I follow on Twitter, named Robert Lee Brewer. He’s a poet, and often posts with hash tags like #poettues and such. I like this guy a lot, and read his blog when I have time. Inspired by a post he made here, I’ve decided to take up the reins of a Poem A Day challenge. Yep, that’s one poem a day, for the entire year. 365 poems in all. I have to write one for tonight, the 25th of January, but guess what, MLD-watchers? I’m on track so far. Just as a background, I used to be a performance poet, a “spoken word artist” as it were. I was no Alvin Lau, but I was not bad at delivering my poetry out loud. I’ve only had a few poems published, put together one or two chapbooks that are now long gone, but I’ve written poetry pretty consistently since I was about 14 years old. You don’t wanna read those old poems. Trust me on that. Once I tried to catalog my written output of poetry, and at 18 years old, I had already written over 400 poems. I’m 31 now. I cringe to think about it. There have been other 365 projects floating around the internet for years. Same notion; do a thing, at least once a day, for a year straight. In fact, Angie and PTB have one going right now, too. You might have already visited. If not, please do. Angie’s skills behind a lens are second to none. Second to NONE, yo. PTB… has an iPhone that takes pictures, too! So, 365 poems. About the amount of poems I wrote between the ages of 14 and 18. Stay tuned at my regular blog to see the new poems as they get written/uploaded. If I fail, I’ll be sure to mention it here, but if I make it to December 31, 2010, and have done all 365? You better BELIEVE I’m celebratin’. 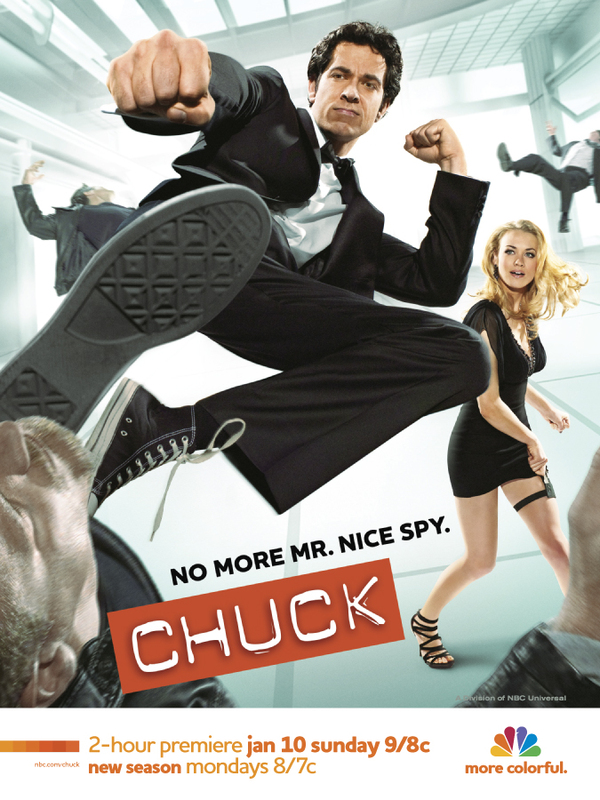 I’m not going to lie to you, Chuck is my favorite TV show. I missed it while it was away and I’m thrilled to see it back. The first two episodes of the season didn’t click with me at first, but I made time to watch them again. After re-watching them before last week’s episode I realized I was just expecting something different from this season and there was absolutely nothing wrong with them. Episode three was fantastic, I really enjoyed the way Devon was losing it under all the pressure and they paralleled it with Chuck being able to hold it together. Also, the continuing malfunctions of the Intersect 2.0 and Buy More Fight Club were outstanding. Last week’s guest star, Angie Harmon, was great, but I can’t tell you how ready I am for this week. Chuck versus Stone Cold Steve Austin…come on! How could I not be excited for this? I even liked The Condemned. Get lost, Lost. Tonight is the highlight of the TV season! What a year 2010 has been so far with Bret Hart on Raw and now Steve Austin on Chuck. Again, it’s my favorite show. The Book of Eli is the story of a man’s journey across the barren wasteland of a world destroyed by war. It’s a story of human nature and faith, and I really enjoyed it. Everything on the screen looks amazing from the first frame. The presentation is visually stunning using a stark and desaturated palette that perfectly suits the world the story takes place in. A large number of close-ups begin many of the scenes, giving them an epic quality. These shots almost seemed to be overused at one point, but turned out to be an excellent storytelling device as the focus of the close-ups shifts late in the movie. The score and audio effects used were also amazing, adding a real depth to events. In particular, two scenes featuring brutal attacks on a defenseless Mila Kunis and the final confrontation between Denzel Washington and Gary Oldman were incredibly powerful as the sound almost went to white noise, overloading my senses. If there was anything to complain about it was that some of the visuals drew my attention away from the story. At times, Eli’s clothes looked too clean. After a fairly graphic fight scene there was almost not enough blood on the ground. Too much water was spilled for the value that was placed on it, and I couldn’t help but notice some product/brand placement. There has also been some criticism of the similarities between The Book of Eli and an indie comic published a few years ago called The Book of Jesse. I don’t know much about the comic (although I plan to investigate), but a lot of the rumblings over it seem superficial. Some complaints were overheard on the way out about the movie being too religious, but let’s face it, if you didn’t know that going in, I don’t know how you even knew about the movie. It’s fairly obvious that there are religious and faith based themes involved. I even saw buses that read “rELIgion is power” advertising the movie; it’s not like this was a secret. Even so, where things could have gotten heavy-handed and sanctimonious in the film, they didn’t. The filmmakers went with a subtle approach that I really appreciated. I’d see The Book of Eli again in a heartbeat. In fact, I’m planning to. However, if you don’t like the idea of God contaminating your post-apocalyptic samurai Western, this isn’t for you. Disclaimer: Before I begin, you should know that we did have a visitor from Utah just last week. However, I had already begun my “research” and wasn’t going to allow this lone visitor to take an installment away from me. Instead they were moved to the top of the list despite being eighth alphabetically. Also, Angie explained to me that Utah spelled backward is “sneeze” while falling asleep last night. 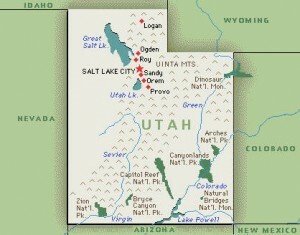 I’ve never visited the state of Utah, because I’ve never really had a reason to. I have every intention of visiting all 50 states before I’m done, but to date Utah has not been prioritized. Maybe this is why Utahns don’t visit MLD. Are they not visiting us because Jerry Sloan’s Jazz are neither bad nor good enough this season to be worthy of note? Sure they smashed the Sixers already this season, but so have 20 other teams. Outside of the NBA, the only time Utah even comes to mind is when I’m listening to the The Dwarves or Angie’s watching Big Love. I suppose Point Break might bring it to mind, and I recall Utah Saints being popular in the raver community circa 1992, but how often does any of that come up? Utah, I know you have towns with great names like Dirty Devil River and Cactus Rat Mine, but outside of Salt Lake City there’s just a whole lot of peoplelessness. So I beckon you, people of the mountain, don’t let that low population density keep us apart. Put down your snowboarding video games and waste your time on us. We can even talk about Roseanne Barr and James Woods if you like. Tags: My Latest Distraction, Things to do in Utah, Utah, What about us? The New Jersey Nets have already set the record for consecutive losses to start a season. Could the Nets break the all-time season loss record? The Nets record is currently 3 and 36, giving them at a winning percentage of .077. This puts them on pace to win 6 or 7 games and finish with 75 to 76 losses. The all time loss record is 73 held by the 1972-73 Sixers (on pace to win a miserable 27 this season). At nearly the halfway point in the season, it’s very possible that the Nets could win less than 9 games. I’ll be keeping my eye on the their numbers this season to see if they could take this distinction away from my beloved Sixers. The Nets play today at 3:30PM against the LA Clippers as part of the NBA‘s Dr. Martin Luther King, Jr. Day schedule of afternoon games beginning at 1PM EST across the league.